...the source of all great mathematics is the special case, the concrete example. It is frequent in mathematics that every instance of a concept of seemingly generality is, in essence, the same as a small and concrete special case. I Want to be a Mathematician: an Automathography in Three Parts (1985), 324. Another diversity of Methods is according to the subject or matter which is handled; for there is a great difference in delivery of the Mathematics, which are the most abstracted of knowledges, and Policy, which is the most immersed ... , yet we see how that opinion, besides the weakness of it, hath been of ill desert towards learning, as that which taketh the way to reduce learning to certain empty and barren generalities; being but the very husks and shells of sciences, all the kernel being forced out and expulsed with the torture and press of the method. Advancement of Learning, Book 2. In James Spedding, The Works of Francis Bacon (1863), Vol. 6, 292-293 . Peter Pešić, explains that 'By Mathematics, he had in mind a sterile and rigid scheme of logical classifications, called dichotomies in his time,' inLabyrinth: A Search for the Hidden Meaning of Science (2001), 73. As for methods I have sought to give them all the rigour that one requires in geometry, so as never to have recourse to the reasons drawn from the generality of algebra. In Cours d’analyse (1821), Preface, trans. Ivor Grattan-Guinness. Difficulties [in defining mathematics with full generality, yet simplicity] are but consequences of our refusal to see that mathematics cannot be defined without acknowledging its most obvious feature: namely, that it is interesting. Nowhere is intellectual beauty so deeply felt and fastidiously appreciated. During the school period the student has been mentally bending over his desk; at the University he should stand up and look around. For this reason it is fatal if the first year at the University be frittered away in going over the old work in the old spirit. At school the boy painfully rises from the particular towards glimpses at general ideas; at the University he should start from general ideas and study their applications to concrete cases. In 'The Rhythm of Education', The Aims of Education and Other Essays (1929), 26. During the time that [Karl] Landsteiner gave me an education in the field of imununology, I discovered that he and I were thinking about the serologic problem in very different ways. He would ask, What do these experiments force us to believe about the nature of the world? I would ask, What is the most. simple and general picture of the world that we can formulate that is not ruled by these experiments? I realized that medical and biological investigators were not attacking their problems the same way that theoretical physicists do, the way I had been in the habit of doing. ‘Molecular Disease’, Pfizer Spectrum (1958), 6:9, 234. Euclid avoids it [the treatment of the infinite]; in modern mathematics it is systematically introduced, for only then is generality obtained. 'Geometry', Encyclopedia Britannica, 9th edition. In George Edward Martin, The Foundations of Geometry and the Non-Euclidean Plane (1982), 130. This is part of a longer quote, which begins “In Euclid each proposition…”, on the Arthur Cayley Quotes page of this website. For it being the nature of the mind of man (to the extreme prejudice of knowledge) to delight in the spacious liberty of generalities, as in a champion region, and not in the enclosures of particularity; the Mathematics were the goodliest fields to satisfy that appetite. In De Augmentis, Bk. 8; Advancement of Learning, Bk. 2. Fourier’s Theorem … is not only one of the most beautiful results of modern analysis, but it may be said to furnish an indispensable instrument in the treatment of nearly every recondite question in modern physics. To mention only sonorous vibrations, the propagation of electric signals along a telegraph wire, and the conduction of heat by the earth’s crust, as subjects in their generality intractable without it, is to give but a feeble idea of its importance. In William Thomson and Peter Guthrie Tait, Treatise on Natural Philosophy (1867), Vol. 1, 28. In The Queen of the Sciences (1938), 2. I believe that natural history has lost much by the vague general treatment that is so common. From 'Note to the Reader', introducing Wild Animals I Have Known (1898), 9. The author explains this is his motivation for writing true stories about individual animals as real characters. 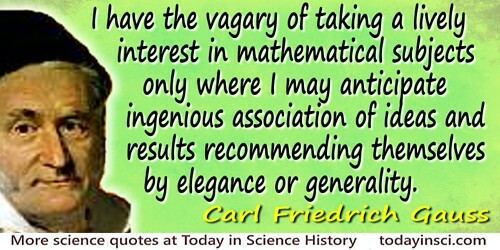 I have the vagary of taking a lively interest in mathematical subjects only where I may anticipate ingenious association of ideas and results recommending themselves by elegance or generality. Letter to Heinrich Schumacher (17 Sep 1808). 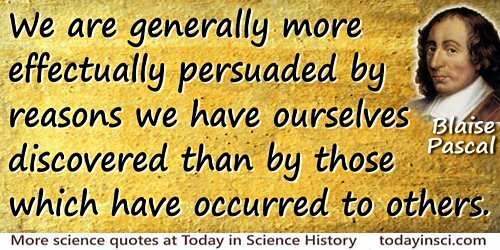 Quoted in G. Waldo Dunnington, Carl Friedrich Gauss: Titan of Science (2004), 416. In 'The Unwritten Chapter on Golf, Nature (1887), 36, 502. In Euclid each proposition stands by itself; its connection with others is never indicated; the leading ideas contained in its proof are not stated; general principles do not exist. In modern methods, on the other hand, the greatest importance is attached to the leading thoughts which pervade the whole; and general principles, which bring whole groups of theorems under one aspect, are given rather than separate propositions. The whole tendency is toward generalization. A straight line is considered as given in its entirety, extending both ways to infinity, while Euclid is very careful never to admit anything but finite quantities. The treatment of the infinite is in fact another fundamental difference between the two methods. Euclid avoids it, in modern mathematics it is systematically introduced, for only thus is generality obtained. In 'Geometry', Encyclopedia Britannica (9th edition). In the expressions we adopt to prescribe physical phenomena we necessarily hover between two extremes. We either have to choose a word which implies more than we can prove, or we have to use vague and general terms which hide the essential point, instead of bringing it out. The history of electrical theories furnishes a good example. It is a peculiar feature in the fortune of principles of such high elementary generality and simplicity as characterise the laws of motion, that when they are once firmly established, or supposed to be so, men turn with weariness and impatience from all questionings of the grounds and nature of their authority. We often feel disposed to believe that truths so clear and comprehensive are necessary conditions, rather than empirical attributes of their subjects: that they are legible by their own axiomatic light, like the first truths of geometry, rather than discovered by the blind gropings of experience. In An Introduction to Dynamics (1832), x. It was badly received by the generation to which it was first addressed, and the outpouring of angry nonsense to which it gave rise is sad to think upon. But the present generation will probably behave just as badly if another Darwin should arise, and inflict upon them that which the generality of mankind most hate—the necessity of revising their convictions. Let them, then, be charitable to us ancients; and if they behave no better than the men of my day to some new benefactor, let them recollect that, after all, our wrath did not come to much, and vented itself chiefly in the bad language of sanctimonious scolds. Let them as speedily perform a strategic right-about-face, and follow the truth wherever it leads. 'On the Reception of the Origin of Species'. In F. Darwin (ed. ), The Life and Letters of Charles Darwin, Including an Autobiographical Chapter (1888), Vol. 2, 204. Mathematics as an expression of the human mind reflects the active will, the contemplative reason, and the desire for aesthetic perfection. Its basic elements are logic and intuition, analysis and construction, generality and individuality. Though different traditions may emphasize different aspects, it is only the interplay of these antithetic forces and the struggle for their synthesis that constitute the life, usefulness, and supreme value of mathematical science. As co-author with Herbert Robbins, in What Is Mathematics? : An Elementary Approach to Ideas and Methods (1941, 1996), x. Men in general are very slow to enter into what is reckoned a new thing; and there seems to be a very universal as well as great reluctance to undergo the drudgery of acquiring information that seems not to be absolutely necessary. In The Commercial and Political Atlas: Representing, by Means of Stained Copper Charts, the Progress of the Commerce, Revenues, Expenditure and Debts of England During the Whole of the Eighteenth Century (1786, 1801), 29. Science deals with judgments on which it is possible to obtain universal agreement. These judgments do not concern individual facts and events, but the invariable association of facts and events known as the laws of science. Agreement is secured by observation and experiment—impartial courts of appeal to which all men must submit if they wish to survive. The laws are grouped and explained by theories of ever increasing generality. The theories at first are ex post facto—merely plausible interpretations of existing bodies of data. However, they frequently lead to predictions that can be tested by experiments and observations in new fields, and, if the interpretations are verified, the theories are accepted as working hypotheses until they prove untenable. The essential requirements are agreement on the subject matter and the verification of predictions. These features insure a body of positive knowledge that can be transmitted from person to person, and that accumulates from generation to generation. The art of doing mathematics consists in finding that special case which contains all the germs of generality. Attributed, perhaps apocryphal. As given in Felix E. Browder, Norbert Wiener (1966), 65. Stated without quotation marks, as “attributed apocryphally perhaps”, in M. Kac, 'Wiener and Integration in Function Spaces', Bulletin of the American Mathematical Society (Jan 1966), 72, No. 1, Part 2, 65. Attributed (apocryphally perhaps). As cited in Bulletin of the American Mathematical Society (1966), 72, 65. The generality of men are so accustomed to judge of things by their senses that, because the air is indivisible, they ascribe but little to it, and think it but one remove from nothing. In Mary Elvira Weeks, The Discovery of the Elements (1934), 29, citing Boyle, 'Memoirs for a General History of the Air', in Shaw's Abridgment of Boyle's works (1725), Vol. 3, 61, and Ramsay, The Gases of the Atmosphere (1915), 10. The great basic thought that the world is not to be comprehended as a complex of ready-made things, but as a complex of processes, in which the things apparently stable no less than their mind-images in our heads, the concepts, go through an uninterrupted change of coming into being and passing away, in which, in spite of all seeming accidents and of all temporary retrogression, a progressive development asserts itself in the end—this great fundamental thought has, especially since the time of Hegel, so thoroughly permeated ordinary consciousness that in this generality it is scarcely ever contradicted. Ludwig Feuerbach and the Outcome of Classical German Philosophy (1886). C. P. Dutt (ed.) (1934), 54. The importance of a result is largely relative, is judged differently by different men, and changes with the times and circumstances. It has often happened that great importance has been attached to a problem merely on account of the difficulties which it presented; and indeed if for its solution it has been necessary to invent new methods, noteworthy artifices, etc., the science has gained more perhaps through these than through the final result. In general we may call important all investigations relating to things which in themselves are important; all those which have a large degree of generality, or which unite under a single point of view subjects apparently distinct, simplifying and elucidating them; all those which lead to results that promise to be the source of numerous consequences; etc. From 'On Some Recent Tendencies in Geometric Investigations', Rivista di Matematica (1891), 44. In Bulletin American Mathematical Society (1904), 444. The person who did most to give to analysis the generality and symmetry which are now its pride, was also the person who made mechanics analytical; I mean Euler. From History of the Inductive Sciences from the Earliest to the Present (1837), Vol. 2, 93. The pursuit of pretty formulas and neat theorems can no doubt quickly degenerate into a silly vice, but so can the quest for austere generalities which are so very general indeed that they are incapable of application to any particular. In Men of Mathematics (1937), Vol. 2, 488. The world is anxious to admire that apex and culmination of modern mathematics: a theorem so perfectly general that no particular application of it is feasible. In 'A Story With a Moral', Mathematical Gazette (Jun 1973), 57, No. 400, 87. There is a finite number of species of plants and animals—even of insects—upon the earth. … Moreover, the universality of the genetic code, the common character of proteins in different species, the generality of cellular structure and cellular reproduction, the basic similarity of energy metabolism in all species and of photosynthesis in green plants and bacteria, and the universal evolution of living forms through mutation and natural selection all lead inescapably to a conclusion that, although diversity may be great, the laws of life, based on similarities, are finite in number and comprehensible to us in the main even now. Presidential Address (28 Dec 1970) to the American Association for the Advancement of Science. 'Science: Endless Horizons or Golden Age? ', Science (8 Jan 1971), 171, No. 3866, 24. There is in every step of an arithmetical or algebraical calculation a real induction, a real inference from facts to facts, and what disguises the induction is simply its comprehensive nature, and the consequent extreme generality of its language. In System of Logic, Bk. 2, chap. 6, 2. These sciences, Geometry, Theoretical Arithmetic and Algebra, have no principles besides definitions and axioms, and no process of proof but deduction; this process, however, assuming a most remarkable character; and exhibiting a combination of simplicity and complexity, of rigour and generality, quite unparalleled in other subjects. In The Philosophy of the Inductive Sciences (1858), Part 1, Bk. 2, chap. 1, sect. 2. Time’s arrow of ‘just history’ marks each moment of time with a distinctive brand. But we cannot, in our quest to understand history, be satisfied only with a mark to recognize each moment and a guide to order events in temporal sequence. Uniqueness is the essence of history, but we also crave some underlying generality, some principles of order transcending the distinction of moments–lest we be driven mad by Borges’s vision of a new picture every two thousand pages in a book without end. We also need, in short, the immanence of time’s cycle. To ask what qualities distinguish good from routine scientific research is to address a question that should be of central concern to every scientist. We can make the question more tractable by rephrasing it, “What attributes are shared by the scientific works which have contributed importantly to our understanding of the physical world—in this case the world of living things?” Two of the most widely accepted characteristics of good scientific work are generality of application and originality of conception. . These qualities are easy to point out in the works of others and, of course extremely difficult to achieve in one’s own research. At first hearing novelty and generality appear to be mutually exclusive, but they really are not. They just have different frames of reference. Novelty has a human frame of reference; generality has a biological frame of reference. Consider, for example, Darwinian Natural Selection. It offers a mechanism so widely applicable as to be almost coexistent with reproduction, so universal as to be almost axiomatic, and so innovative that it shook, and continues to shake, man’s perception of causality. In 'Scientific innovation and creativity: a zoologist’s point of view', American Zoologist (1982), 22, 230. Whatever be the detail with which you cram your student, the chance of his meeting in after life exactly that detail is almost infinitesimal; and if he does meet it, he will probably have forgotten what you taught him about it. The really useful training yields a comprehension of a few general principles with a thorough grounding in the way they apply to a variety of concrete details. In subsequent practice the men will have forgotten your particular details; but they will remember by an unconscious common sense how to apply principles to immediate circumstances. Your learning is useless to you till you have lost your textbooks, burnt your lecture notes, and forgotten the minutiae which you learned by heart for the examination. What, in the way of detail, you continually require will stick in your memory as obvious facts like the sun and the moon; and what you casually require can be looked up in any work of reference. The function of a University is to enable you to shed details in favor of principles. When I speak of principles I am hardly even thinking of verbal formulations. A principle which has thoroughly soaked into you is rather a mental habit than a formal statement. It becomes the way the mind reacts to the appropriate stimulus in the form of illustrative circumstances. Nobody goes about with his knowledge clearly and consciously before him. Mental cultivation is nothing else than the satisfactory way in which the mind will function when it is poked up into activity. In 'The Rhythm of Education', The Aims of Education: & Other Essays (1917), 41.